Its curtains down for ESOF 2010 today. The conference saw a lively mix of reviews of research advances in various fields, as well as policy dialogues, several of which are discussed in developing countries too. And given the European Commission’s support for research in Africa, at least sessions looked at issues in Africa. There have been other lively sessions – pizzas with profs for young scientists below 35 years who got a chance to interact with top Italian scientists over lunch (what else but pizza in Italy?). I gather this is a specialty of ESOFs – it was salmon with the scientists in Stockholm; and Tapas in Barcelona. I would strongly recommend a scientists and samosa or scientists and idli/vada at the next Indian science congress. Scientists at ESOF 2010 in Turin have been speed-dating too. Now don’t get the wrong ideas. That was innovative speed-dating between scientists and business/industry to quickly acquaint each other of their fields of work and likely mutual interests. Cool. Before I sign off, special thanks to the Robert Bosch Foundation whose fellowship helped cover the conference. Efforts by developing countries to tap renewable sources of energy run into two typical problems – finding cheap and widely usable technologies; and connecting renewable energy to the main electricity grid. Europe is ahead on the (not necessarily cheap) technology front. But it too is grappling with the grid connectivity question, discussed at a session at ESOF 2010. The European Union (EU) plans to raise the share of its renewable energy sources in its total energy consumption to 20 per cent by 2020. This has implications for designing, operating and maintaining power transmission networks across and within countries. Gianluca Fulli, from the European Commission’s Joint Research Council, suggests using high voltage direct current (HVDC) grids – electric systems that use direct current to transmit the bulk of the electricity. Traditionally Europe uses a high voltage alternating current (HVAC) system, but HVDC is preferred for long-distance transmission from large, off-shore plants to the grid inland with fewer losses, says Fulli. Scientists are addressing storage options for renewable energy. Maria Rosa Palacin, from the Materials Sciences Institute, Barcelona, points out that systems of energy production and transmission leave very little room for storage. Storage systems are crucial, given the fluctuating nature of some of the renewables. For example, Spain’s moody winds can account for 30 per cent of the electricity on a good day and as little as 2 per cent on a bad day. Palacin says potential storage options include batteries, or a ‘flywheel’ in which the energy is stored as kinetic energy that powers a motor that spins a rotating disc and releases the energy by slowing the wheel down. Other storage options include a ‘hydro’ option where electricity pumps water from a lower reservoir to a higher reservoir and is released by pumping back to the lower reservoirs; and a compressed air energy storage system where the electricity is used to inject air at high pressure into an underground cave and is released through a gas turbine. Research stations set up in the Himalayas and Andes under collaboration with European research institutes will feed in crucial inputs on glacier melt due to climate change. They are part of the World Meteorological Organization global atmospheric watch network (GAW) programme, which operates about 300 stations in 80 countries to monitor changes in the atmosphere. An upcoming research station, 5,320 meters high at Chacaltaya in the Bolivian Andes, will be the first to provide inputs from the soutehrn hemisphere, Angela Marioni, from Institute of Atmospheric Sciences and Climate ( ISAC) at the Italian National Research Council (CNR), told ESOF 2010. The 18,000-year-old Chacaltaya glacier is shrinking at an alarming pace. The Bolivian station is expected to provide inputs on changes in the atmospheric composition in “less than two years”. In 2006, the United Nations Environment Programme helped set up a Nepal Climate Observatory, on an icy pyramid 5079 metres high in the Khumbhu valley in the Himalayas, to track pollution across Asia that was causing a brown haze called the atmospheric brown cloud. The Nepal observatory measures changes in green house gases, ozone-destroying chemicals as well as tiny polluting particles in the air over the Himalayas and Karakorum mountain ranges in Asia. It will also study weather patterns, glaciers and rock changes in the Himalayas and Karakorum mountain ranges in Asia. The two will add to data from Alps stations, such as the Jungfraujoch station and the Plateau Rosa, that measure solar radiation, levels of ozone-destroying chemicals as well as concentrations of greenhouse gases. “A glacier is a perfect instrument that integrates all the signals from the atmosphere from the climate point of view and meteorological point of view,” says Claudio Smiraglia, professor of geography at the University of Milan. His studies show the total surface area of Alps glaciers has reduced from 4,474 square kilometres in 1850 to 2,271 in 2000; while the number of glacier lakes has increased. “We will have a constant struggle between retreating ice, between new water formations and new vegetation trying to come up,” warns Smiraglia. “In Italy we teach our children that mistakes are unacceptable. If you don’t know the right answer – don’t answer!” Such an attitude hardly helps students turn to science, points out Michela Mayer, from the National Institute for the Evaluation of the Education System. Teachers are the driving force towards increasing interest, she told an ESOF 2010 session on 4 July. Students’ declining interest in science seems a common concern worldwide, in developed and developing countries alike. India and China are on a major drive to attract students to science. Indeed, a separate session at ESOF addressed the question: “Why the hell should I become an academic scientist?” Despite Europe’s policies and initiatives to attract young people to science careers, replete with visions of fascinating and rewarding lives, many scientists feel that their experiences do not match up to expectations. By the time they have finished grappling with short-term contracts, long periods of mobility and fierce competition for academic positions, the fascination for science begins to wane. How do we hook students to science? European education experts are trying to woo students back to science. Joachim Dengg, from the Leibniz Institute of Marine Sciences, Germany, says a sense of adventure draws the attention of school children. Dengg took students out with ocean scientists for a project on how much the ocean churned when the ferry turned. “This attracts future students and fosters natural science in general,” he says. Dengg says there is no way to map whether the students eventually opt for a science degree, but they like to broadcast their experiences on You Tube. His co-panelists agreed that Twitter and blogs are increasingly used by teachers, students and scientists alike to communicate with each other. More young tweeting Einsteins in the making? Would Einstein be on Twitter? The question, which was the title of a session at ESOF 2010, has no easy answer: had social media tools existed back then, would Einstein have blogged, tweeted or chatted about his theories on Facebook? From the blackboard to Blackberry? Social media tools have revolutionised how some scientists communicate about their work; how peer-reviewed journals now blog, tweet and hit Facebook and how science journalists tap them as sources of information. An overfull room on 4 July addressed the pros and cons of the new tools. First came some sobering news from Barbara Diehl, University of Oxford, United Kingdom, who says social media have not influenced the publication process for original research. BUT a number of journals are experimenting with these tools to engage with their readers and stimulate debate. Some journals not only encourage but also oblige scientists to make their data publicly available; host a large number of blogs and social networks in which scientists exchange notes not only about their work but also about professional woes and challenges. There are some advocates for using the web for peer review and publishing. They argue that this may help put holes in the ‘wall of consenus’ during peer review; address quality control mechanisms that sometimes slip up even in the best of journals and may open up scientific debate for people hitherto not on the radar of established science – ie. scientists from developing countries. Those who oppose using the web for such purposes argue that it does not mean more efficient quality control and that patents will not be granted for results considered already ‘published’ on the web. There are still others rooting for an ‘open notebook’ approach where the entire progress of a research project should be available online. The pros are more efficient research processes and less time lost in repetitive research. The cons are fears of data theft and a data tsunami. Some believe that blogging scientists can replace us pesky science journalists. But I am relieved to hear Holger Wormer, professor of science journalism at Dortmund University in Germany, asserting we are irreplaceable. What makes agricultural extension services tick? Can agricultural extension services, designed to bridge agricultural research outputs with farmers, offer a model for making science understandable to society at large? 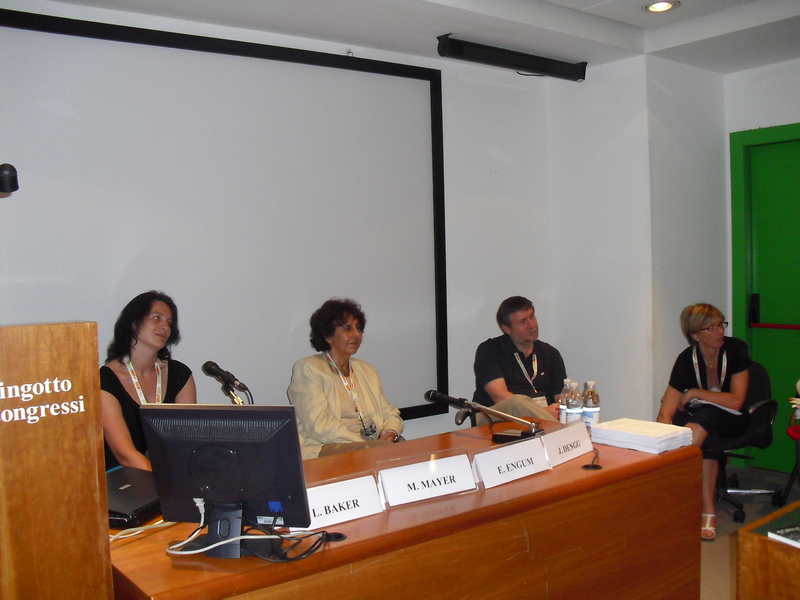 A session at ESOF 2010 pondered over what works in agricultural extension and why. The International Food Policy Research Institute (IFPRI), for example, found the cost of fertilisers was hobbling farmers’ productivity in Africa. So extension services are geared to advise on the use of locally available organic fertilisers, says IFPRI scientist Kristin Davis. Farmers need to know how they can work at optimum levels in changing climate conditions, and how to adhere to food safety standards, she adds. Moussa N’Dienor, scientist at the Institute of Research for Development, Senegal, points out that farmers are additionally having to address land and water management issues, as well as coping with the high competition and stringent quality requirements of international markets. The snag is that, unlike large international research structures, rural advisory services are suffering from declining national support; and lack direction regarding investment priorities and evidence-based policy recommendations. The Global Forum for Rural Advisory Services, launched in January 2010, seeks to address some of these gaps. The forum’s launch coincides with renewed interest in agricultural extension or advisory services that comes in the wake of rising food prices; renewed government and donor interest in agricultural and related advisory services; and a broad global commitment to restructure agriculture development institutions. The word ‘nano’ has caught the world’s attention and we even have a car named the Nano,” David Guston from the Consortium of Science, Policy and Outcomes in the United States told a session on anticipatory governance of emerging technologies, at ESOF 2010 on 3 July. Anticipatory governance develops foresight, engagement and interaction with the public on their hopes, fears and expectations of nano and other new technologies, to help in more objective decision making. Taking cues from developed countries, several developing countries too have joined the nano bandwagon, ignoring risks and regulatory aspects. The ESOF session highlighted how nano-, and other emerging technologies, are challenging existing institutions of governance because they contribute to novel, unpredictable, yet potentially revolutionary innovations. Ultimately, public attitudes could influence their development, and it would be a good idea if, while scientists and engineers continue with their research, social scientists start mapping human responses to emerging technologies. Ulrike Felt , a social scientist from the University of Vienna, says it is important to “understand the dynamics of (the public’s) expectations”. Citizen engagement with nano fairs and workshops to educate, interact and debate is vital to sensible anticipatory governance, says Felt. The United Kingdom, apparently, has a more dialogue-based approach. So says Matthew Kearnes from Durham University, who worked on building social intelligence into nano scale science and engineering research. The project dealt with how policy makers could engage with the public with regard to emerging technologies; and involved verifying public understanding of science, dialogue and public engagement. Europe seems increasingly focused on public engagement on critical issues. Parliamentarians met at ESOF on 4 July to figure out how ‘parliamentary technology assessment’ (PTA) could support them in anticipating and managing the impact of science and technology on future societies. Given the rapid advances in science and technology and their impact on a country’s economy, environment and society, policy makers need to keep abreast of the latest knowledge to promote or regulate new technologies, they say. You are currently browsing the archives for the ESOF 2010 category.